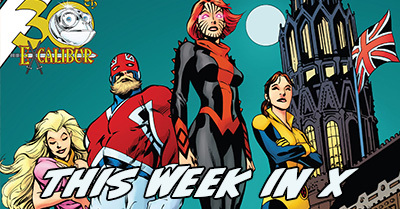 You are here: Home / consume / comic books / This Week in X: Excalibur Returns (sort of) in X-Men Gold, X-Men Blue climaxes, and more! Love the video? Love this post? Please let me know, because “This Week In X” is a pilot right now – there is no guarantee I’ll continue it past the end of this month unless folks are clamoring for more! Cable #153 cover by Jon Malin with colors by Federico Blee. Written by Ed Brisson with line art by Jon Malin, color art by Jesus Aburtov, and letters by Travis Lanham. Cover by Malin with colors by Federico Blee. Most-recent place to start: Issue #150, the first with Legacy numbering after an initial arc on issues #1-5. This iteration of Cable is a sort of “time cop” who is keeping an eye on aberrations in the timeline (and trying to correct them when they occur). After noticing that the External Candra had been murdered at a time she ought to be alive, Cable recruited Longshot to investigate if other Externals were also indanger. 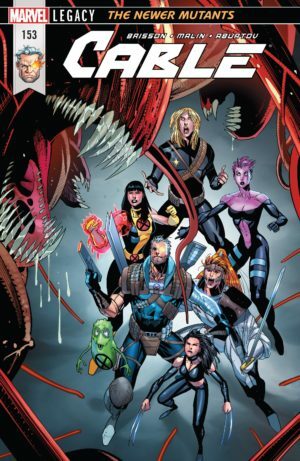 As Selene and other Eternals joined the hunt for their murderer with the aid of Blink, Cable added Shatterstar, Astonishing-era Armor, and pre-X-Men X-23 to his team. I’ve been really trying to find a way to enjoy this arc, especially because I love Jon Malin’s art and its nods to Marc Silvestri and Rob Liefeld. The story is not making it easy. We’re in the midst of an Externals murder mystery full of time-traveling intrigue that doesn’t make a ton of sense. Cable isn’t acting in-character and neither is his team. These annoyances are creating a lot of drag on a story that is otherwise crackling with action. Ed Brisson writes a stern Cable who doesn’t show his hand because he’s not holding any cards. In the past, Cable’s sternness often came from not wanting to reveal his foreknowledge of the future or his multiple levels of strategy. Here, he just seems like an incompetent leader thrashing wildly without a plan. I think it’s fine for Cable not to have a plan, but if that’s the case I’d like to see more of his gears turning along the way through the mission. He leads his team straight into a massive trap and is completely unprepared for the ramifications. Before we can get to that, we get the big reveal of the villain behind our murder mystery. It’s satisfying, but it emphasizes how hard the time-traveling in this series is to follow. Click for a lot of kvetching about time travel math. This story arc (and this issue) opened by letting us know the External murders were set 13 years ago – which, in the sliding timescale of Marvel continuity, is not too long after the emergence of the Fantastic Four. That could be the case, as we see no contemporary markers of the X-Men in the past. However, last issue the characters made reference to in-continuity events from 1996’s X-Force (1991) #52 as being “over a decade ago” while in a 13 years ago scene. That only makes sense if we’re treating real-world time as being the same as Marvel time, with X-Force #52 happening 22 years ago and the “13 years ago” present representing 2005 – the present day for the Armor and X-23 that Cable recruited for his mission. Except, Marvel time hasn’t been equivalent to real world time since the 80s or earlier. There’s no way that X-Force #52 was more than 22 years ago for our characters! Even if there is a way this all makes sense and I’m just totally missing it, it’s the editorial team’s job to help it make sense for the reader. 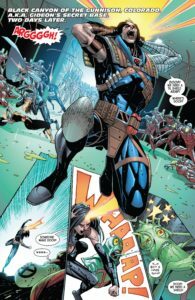 The book has never once given the indication that Cable doesn’t want to travel far from the 2005 anchor point, which would be a good reason why he pulled in Armor and X-23. Further confusing things, in this issue we see Armor manifesting her powers in a way that was only possible after many members of her family died much later in Astonishing X-Men than where she’s been plucked from. Similarly, we have a rabid, untrained X-23 who has never met the X-Men quietly cooperating on a mission and not being particularly deadly or effective. On one hand, Cable should have never chosen her. On the other, at this point she’s an unstoppable killing machine, and we’re not seeing that on the page. Editors should have kindly pointed out to Brisson that it would make more sense to use an X-Force-era X-23, if we had all of time to choose from. Who knows – maybe a late-stage reveal will explain the time hijinks and show that Cable had a reason for picking these two women from when he did. Maybe it’s a Groundhog’s Day scenario, where he’s pushed through each portion of this murder investigation multiple times but only made it this far with the oddball team he assembled. That said, if we take the time math as 2005 means Cable had all of pre-Decimation X-Men Academy to choose from – a cast of dozens of cool, under-used mutants. Or, Cable cold have picked a team of present day mutants at the peak of their training to bring back to with him? In either timeline, Armor and X-23 could have easily been substituted for a telekinetic like Hellion and a nimble combatant like Pixie or Dust. I’m really trying to let go of my continuity concerns to enjoy the present run of X-Men comics, but it’s hard when everything is wrong from character voices to references to continuity. I’d even be willing to give this book a pass if it made sense all on its own, but the amount of banging my head against the wall it took to even figure it out well enough for this post means there’s something incredibly broken about this otherwise very cool story. Written by Ed Brisson with line art by Mike Deodato Jr., color art by Frank Martin, and letters by Cory Petit. Cover by Deodato and Martin. Most-recent place to start: While you could pick up this book at the start of this arc with #31, starting with either of the prior arcs (at #21 or #25) will give you more context to the mental state of Old Man Logan. The far-future Old Man Logan we first met in the now-legendary Mark Millar and Steve McNiven story came back to the present with no explanation after Secret Wars at the end of 2015. 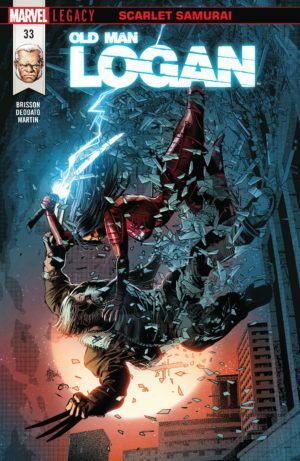 I’m enjoying this current story-arc, which finds Logan in Tokyo, begrudgingly teaming with the new Silver Samurai against The Hand as they try to create a more indestructible version of their ninja foot-soldiers. The problem is that it feels very much like a Wolverine story, and not at all like an Old Man Logan story. In the last story, Brisson and Deodato told what felt like the most quintessential Old Man Logan (OML) story yet, with him having to directly face down the Hulk gang that killed his family and find the compassion to disarm them. That was some major, unexpected, character growth, and a story you could not possibly tell with a present day Logan or one from a different reality. My fear here is that Ed Brisson is really blurring the line between stories that are fundamentally OML and stories that are just Logan. This story, about Samurai, The Hand, and memories of Mariko, feels like it could be told with any Wolverine who lived through the Claremont era of X-Men. I’m hoping that we get some interesting emotions in the following issue with OML reunited with his original lost love, as was hinted at here. Mike Deodato and Frank Martin continue to deliver an impressive run of art on this series. I don’t know that the fight choreography here is as interesting as it’s been. Phoenix Resurrection #3 Cover art by Leinil Francis Yu with colors by Rachelle Rosenberg. Written by Matthew Rosenberg with pencils by Joe Bennett, inks by Lorenzo Ruggiero, colors by Rachelle Rosenberg, and letters by Travis Lanham. Cover art by Leinil Francis Yu with colors by Rosenberg. Most-recent place to start: Issue #1, out just two weeks ago. Strange psychic phenomena around the globe are triggering Cerebro and presenting the X-Men with brief fights against classic foes who disappear into thin air. 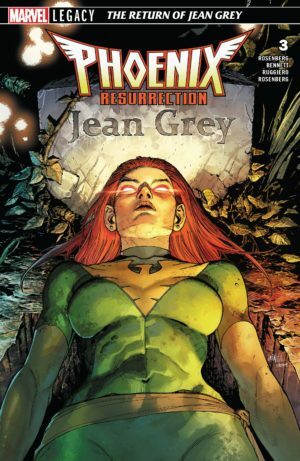 Meanwhile, we see an unpowered Jean Grey living a seemingly pedestrian life as a diner waitress in a reality full of X-Men who have died – though, there seems to be some relationship between the population of her reality and the villains the X-Men are encountering around the globe. This week is another very brisk issue, and if we weren’t on a weekly release schedule I think I’d rate it much lower. There’s not too much to say for it. It’s a lot of a hapless Jean cluelessly running around in her little psychic world that’s staffed with all manner of deceased X-Men. Meanwhile, in the real world, the X-Men make a shocking discovery in their cemetery that leads Kitty Pryde to confront her least-favorite teammate of all time (who is deliciously surly in this brief appearance). It all winds up with the mother of all fan-service with a massive A-team of just about every awesome adult X-character in New Mexico, and from the cliffhanger it seems like they are about to somehow intersect with Jean’s world. Artist Joe Bennett isn’t of the same superstar caliber as Yu and Pacheco on the prior two issues. He has some trouble with a few simple things, like Emma Frost sitting in a chair and Warpath’s mask. However, I liked him on this chapter because his real-world scenes with Jean have a wonderful, grounded texture to them. Written by Cullen Bunn with pencils by R.B. Silva, inks by Adriano Di Benedetto, colors by Rain Beredo, and letters by Joe Caramagna. Cover by Art Adams with colors by Federico Blee. Most-recent place to start: The current arc begins with #16, and so far hasn’t included too much material that would require you to have read issues prior to that. The time-displaced original X-Men broke with Kitty’s school in the wake of Inhumans vs. X-Men to continue their training and adventures under the direction of Magneto, who is still on the aggressive in preemptively eliminating threats to mutant kind. That plot thread gets thrown out the window after the first pair of issues, instead focusing on bringing in additional characters from canceled realities to join the team – including Wolverine’s son Jimmy Hudson from the Ultimate Universe and Bloodstorm (a vampire Ororo Munro who still has her powers) from Mutant X. Most recently, a ripple of changes from the past seems to erase Magneto, Polaris, and Danger, and Magneto insists Jean must use his prototype time machine in the basement to go back in time. The X-Man first leap forward to 2099, then back to 90s Generation X, learning in both periods that they have turned to a team of violent villains. They finally travel all the way back to one of their earliest encounters with Magneto. Cullen Bunn steers hard into the X-Men’s tangle of cross-time plot threads as he brings his run to a seeming climax, finally give some weight and context to his All-New X-Men being stuck in the present day. This issue is where everything comes to a head – a massive payoff after over eighty issues of this team in the present day. Not only that, for the climatic reveal Bunn actually goes back to repair a dangling plot from before Secret Wars! It all looks terrific thanks to art from R.B. Silva and inks by Adriano Di Benedetto. Together, they give a strong impression of the Stuart Immonen art that kicked off the run of this young team back in 2013 with Brian Bendis writing. 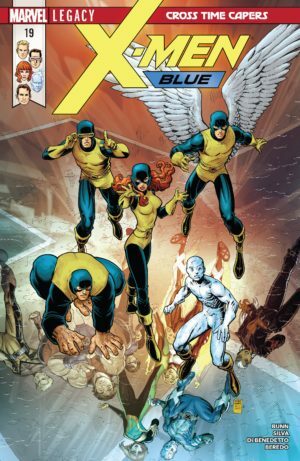 I applaud Bunn going way over-the-top with cross-time X-Men capers with this team, making them a sort of blend of early Excalibur and Exiles – a lightning rod for every possible bit of time shenanigans (except for the ones in Old Man Logan). The feeling that Bunn is driving somewhere that has some amount of finality makes me feel better about elements I don’t usually like, like adding Jimmy Hudson and Bloodstorm in the present day (that’s at least a sixth Wolverine analog and third Storm analog, for those counting). It’s nice to see someone insert a sort of “grand design,” if you will, to all the disparate pieces of current time trauma and make them into something whole. Lead story written by Marc Guggenheim and Leah Williams with pencils by Alitha E. Martinez, inks by Martinez and Craig Yeung, colors by Jay David Ramos and Dono Sánchez-Almara, and letters by Cory Petit. Back-up story written by Monty Nero with line art by Djibril Morissette-Phan and color art by Michael Garland, and letters by Cory Petit. Most-recent place to start: You can read this story on its own! It does not heavily refer to any points of recent continuity except for a reference to Rachel Grey’s experiences in issues #5-6. However, the issue itself says it comes after the arc that begins in #18 (and has not yet ended with #22). Kitty Pryde takes charge of the X-Men in the wake of Inhumans vs. X-Men from a battle-weary Storm. She decides to move the mansion from Limbo to the middle of Central Park to try to erode the narrative of mutants being separate from humans. It’s an uphill battle, as her team faces a new Brotherhood of Evil Mutants who were assembled by a human woman at the fore of the anti-mutant movement. Kitty’s team varies, but usually includes her old Excalibur teammates of Nightcrawler and Rachel Grey, along with Storm, Colossus, Old Man Logan, and a handful of students. The limits of Rachel Grey’s powers have been repeatedly tested by the team’s adventures, and she seems to have accessed a new level of psychic finesse – which also brings back her old hound markings. Marc Guggenheim reaches back to the X-Men’s first sleeper, slept-on hit (and my favorite comic series of all time!) for an Excalibur 30th Anniversary tale! I haven’t felt that Guggenheim has a particularly good handle on the voices of any of his chosen cast, and this issue didn’t do anything to change my mind even with the presence of co-writer Leah Williams. No one in this issue does anything that feels particularly them – almost all of their actions and most of their words seem interchangeable. The exception is Rachel Grey. As the X-Men’s longest-running cross-time character, Rachel is much more a part of the present than her former future – moreso than Cable, for certain! Yet, many writers treat her as a sort of vestigial limb on the Grey/Summers family tree. Not Guggenheim. He’s one of the few writers (the only writer?) to really understand Rachel’s history and progression as a character. As much as this title has mostly been “The Kitty Pryde Show,” he finds a key moment for Rachel in nearly every issue. 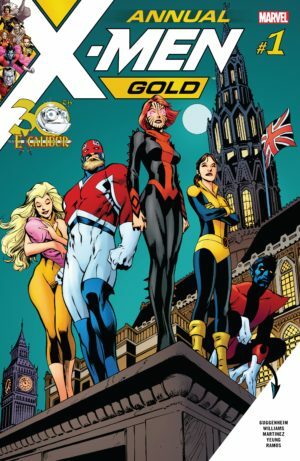 Here, it’s in the form of a long forgotten plot thread linking back to the Dark Phoenix Saga that happens to come back for Rachel just as she is celebrating with her friends at the rebuilt Excalibur lighthouse. The art for the first portion of this issue is strong – characters are on-model, with an impish Nightcrawler and a baby that really feels like a baby (something a lot of comic artists have trouble managing). However, an inking change around page 18 leaves everything feeling a bit gawky and mushy-edged for a few pages. The colors are incredibly strong throughout – bright without being glossy or shiny, which is a wonderful nod to the always-colorful Alan Davis run on Excalibur. Guggenheim and Williams reach a nice approximation of Excalibur’s tone, even if it does mean saddling yet another character with the death knell of a baby. I’m not sure why so many (mostly older, mostly male) writers insist in this, when virtually the only place it’s ever been done well is in the team-as-family Fantastic Four (and look where they are right now) and the new run of Superman. 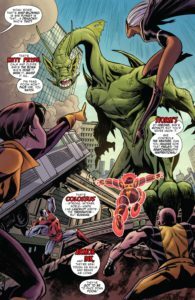 The back-up is a story of a young Storm fan trying to find a picture perfect moment with her hero as the X-Men race around New York saving it from Mole Man and other monstrous invasions. It’s a sweet, short tale that has a sort of Ms. Marvel feel to it, in that’s it’s about pure adulation of your heroes that helps blot out the downsides of their actions. I was a particular fan of the artwork from Glitterbomb’s Djibril Morissette-Phan. It’s a nice, casual, real-work look that would fit Gold nicely on an ongoing basis when the team is based in New York. I am definitely loving this new series. I’ll read anything X-Men from you. After reading it I watched the video too. Your enthusiasm on camera really makes the material even more enjoyable in that format! Thanks for everything! This was awesome. I liked having both the video and the blog to get a better understanding of the comics from this week. Keep it up!